Description: God's Creative Power Will Work for You by Charles Capps, the original mini book in the God's Creative Power Series, and has sold over 3 million copies! God's Creative Power for Healing was the second book in the series and together they have sold an amazing 5 million copies! Now, this in demand third title joins the family, God's Creative Power for Finances. Providing concise teaching and applicable Scripture-based confessions, readers will learn how put to God's creative power at work in their finances. They will discover and develop an understanding of how their words combined with God's Word will positively affect their future. Dimensions: 3 1/2" x 5 1/2"
God's Creative Power for finances has brought break-through! 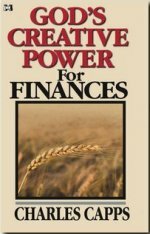 I've been confessing the Word of God found in Charles Capps book God's Creative Power for Finances and have seen my finances go from lack to prosperity! Now I am able to give and give abundantly! I love being able to have more than enough to help those in need!